Shiri Freda Appleby (born December 7, 1978) is an American actress and director. She is best known for her leading roles as Liz Parker in the WB/UPN science fiction drama series Roswell (1999–2002) and Rachel Goldberg in the Lifetime/Hulu drama series Unreal (2015–2018). Her major film credits include A Time for Dancing (2000), Swimfan (2002), Havoc (2005), Charlie Wilson's War (2007), and The Devil's Candy (2015). Appleby also starred as intern Daria Wade in the final season of the NBC medical drama series ER (2008–2009). She later starred as Cate Cassidy in The CW drama series Life Unexpected (2010–2011) and as Lucy Lambert in the web comedy series Dating Rules from My Future Self (2012). Appleby also had recurring roles on the NBC drama series Chicago Fire (2012–2013) and the HBO comedy-drama series Girls (2013–2014). Appleby was born in Los Angeles, California, the daughter of Dina Appleby (née Bouader), a Jewish day school teacher, and Jerry Appleby, a telecommunications executive. Her mother is Israeli and of Sephardic-Moroccan Jewish background, and her father is of Ashkenazi Jewish descent. Appleby's mother was an actress in Israel. She and her younger brother Evan were raised in Calabasas in Los Angeles County. They kept kosher in their home growing up. Appleby graduated from Calabasas High School in 1997. She attended University of Southern California from 1998 to 1999, where she studied English. After two years she got the starring role in Roswell and was working steadily, but while shooting Life Unexpected in 2010, Appleby started to work towards a psychology degree from the online University of Phoenix. It took her 14 months—from start to finish, with a large chunk of time spent working, to complete the degree, which she did in 2012. Appleby began her acting career at the age of four, starting with advertisements for various products such as Cheerios and M&M's. She started acting and taking acting classes because her parents were concerned that she was so shy and introverted. Her first advertisement was for Raisin Bran, but it was never aired. She made guest appearances on many television programs, most notably thirtysomething (1987), Doogie Howser, M.D. (1989), ER (1994), Baywatch (1989), Xena: Warrior Princess (1995), 7th Heaven (1997), Beverly Hills, 90210 (1990), before landing her break-out role in the series Roswell (1999–2002), where she tried out for the roles of Isabel and Maria before landing the leading role of Liz Parker. Appleby has been featured in a number of music videos, such as Bon Jovi's video for "It's My Life" with Will Estes, and the 2004 video for the song "I Don't Want to Be" by Gavin DeGraw, opposite Scott Mechlowicz. She also appeared in Sense Field's music video for "Save Yourself," which is part of the Roswell soundtrack and featured in the first season DVD box set. In 2006, she had a recurring role on the short-lived ABC drama Six Degrees as Anya, a young assistant in a relationship with a much older photographer. Later that year, she played Hildy Young in the new USA Network series To Love and Die, that began airing in late December 2008. She also participated in a short film called Carjacking directed by Dan Passman and co-starring Geoff Stults. In 2007, she appeared in the movie What Love Is alongside Cuba Gooding Jr., Matthew Lillard, and Anne Heche. She also participated in another short film, Love Like Wind, from Shaolin Film Productions. At the end of the year, she appeared as Charlie Wilson's press secretary in the film Charlie Wilson's War, which stars Tom Hanks and Julia Roberts. In 2008, Appleby had a recurring role on the 15th and final season of ER (her second time on the show), playing an intern named Daria Wade. In 2010, Appleby starred in The CW network drama Life Unexpected as Cate Cassidy, a radio talk show host whose daughter whom she gave up for adoption becomes a part of her life. The show was canceled after two seasons. In 2012, Appleby starred as the main character of Dating Rules from My Future Self, which she also produced. In 2013, she had a role in the Lena Dunham HBO series, Girls, which was controversial for its portrayal of male ejaculate. She said the role allowed her to break out of a career where she was often typecast as being sweet. Appleby said that she got the role because she was shadowing director Jesse Peretz (as she is interested in directing), and talked with Girls producer Jenni Konner, whom she was friendly[vague] with. Konner asked her if she would be interested in the part. In 2013, she was cast in the leading role in the Lifetime drama/dark comedy series Unreal, a show about the inner workings of a reality show (a show within a show), which premiered on June 1, 2015, and was produced by former The Bachelor producer, Sarah Gertrude Shapiro and writer Marti Noxon. To research her role as a reality show dating show producer, Appleby said that she spent time with a producer to quiz them about the work. She said that one of the appeals of the show was that the central focus was not about her character being in a romantic relationship. The show garnered strong reviews and had been picked up for four seasons. In 2016, Appleby directed her first episode of Unreal, titled "Casualty". She went on to direct multiple episodes of the series. In July 2018, the series ended after four seasons. In Hebrew, the word shiri means either "my song" or "my poem" or simply "sing" (first person female imperative). Appleby said her parents said that when she was born, she was like the song in their hearts. She has a scar above her left eyebrow that she got when a neighbor's dog bit her when she was young. To get over her fear of dogs, she went on the show Emergency Vets, accompanying staff veterinarian Dr. Kevin Fitzgerald (she also overcame another phobia in the same episode by holding a live snake, one of Fitzgerald's patients) and shortly after adopted a tabby cat, which she named Abby. In July 2012, Appleby got engaged to her boyfriend of two years, chef and restaurateur Jon Shook, during a trip to Ventotene, Italy. Shook is the co-owner with Vinny Dotolo of the Los Angeles restaurants Animal, Son of a Gun, Trois Mec, and Jon & Vinny's. Shook said that he met Appleby through his business partner Dotolo's wife, who was friends with Appleby. In December 2012, the couple announced that they were expecting their first child in early 2013. Appleby gave birth to a girl, Natalie Bouader Shook, on March 23, 2013. They have since married. Their second child, son Owen Lee Shook was born on December 17, 2015. 1987 Thirtysomething Little Hope Episode: "The Parents Are Coming"
1988 Freddy's Nightmares – A Nightmare on Elm Street: The Series Marsha at 10 Episode: "Freddy's Tricks and Treats"
1988 Dear John Girl Episode: "Hello/Goodbye"
1990 The New Adam-12 Debbie Lavender Episode: "Teach the Children"
1993 Doogie Howser, M.D. Molly Harris Episode: "Love Makes the World Go 'Round... or Is It Money?" 1993 Raven Jess Episode: "The Guardians of the Night"
1993 Against the Grain Claire Episode: "Pilot"
1994 ER Ms. Murphy Episode: "24 Hours"
1995 Brotherly Love Fairy #1 Episode: "A Midsummer's Nightmare"
1997 Baywatch Jennie Episode: "Hot Water"
1997 7th Heaven Karen Episode: "Girls Just Want to Have Fun"
1997 City Guys Cindy Episode: "Bye Mom"
1999 Beverly Hills, 90210 René Episode: "Local Hero"
2000 Batman Beyond Cynthia (voice) Episode: "Terry's Friend Dates a Robot"
2008 Welcome to The Captain Heather Episode: "The Wrecking Crew"
2008 Fear Itself Tracy Episode: "Community"
2011 Royal Pains Stella Episode: "Rash Talk"
2013 Law & Order: Special Victims Unit Amelia Albers Episode: "Military Justice"
2014 Elementary Dalit Zirin Episode: "The Hound of the Cancer Cells"
2019 Law & Order: Special Victims Unit Kitty Bennett Episode: "Dearly Beloved"
2011 Whole Day Down Moon Episode: "Genesis"
2012 Dating Rules from My Future Self "The Last Shrimp"
2012 Sketchy "Got the Check"
2019 Roswell, New Mexico "Songs About Texas"
^ Paley Center for Media (30 July 2015). "PaleyLive: An Evening with the Cast & Creators of UnREAL". Yahoo!. Archived from the original on 19 October 2015. Retrieved 1 August 2015. ^ a b Harris, Aisha (11 March 2013). "A Seminal TV Moment f/k/a HBO's Girls "money shot": Was it the first in TV history?". Slate Magazine. ^ "Shiri Freda Appleby - California Birth Index". FamilySearch. Los Angeles, CA. 7 December 1978. Retrieved 29 July 2015. 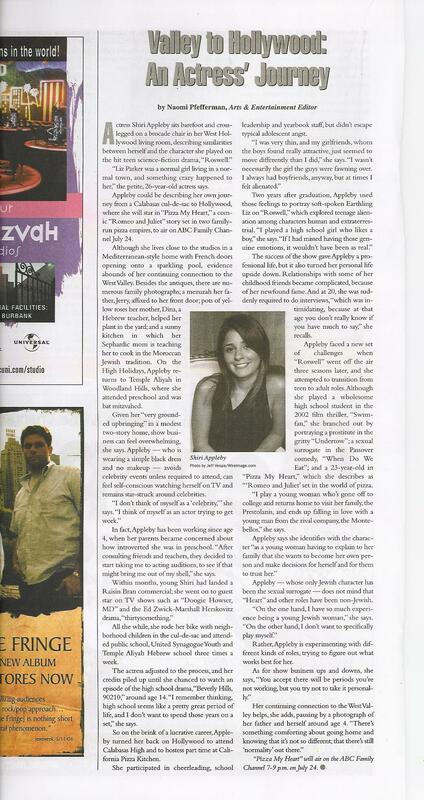 ^ "Dina Bouader mentioned in the record of Jerry S Appleby and Dina Bouader". FamilySearch. Los Angeles, CA. 20 July 1975. Retrieved 29 July 2015. ^ "Actress Shiri Appleby chats about Jewish influences and life on the small screen - Hollywood". Jewish Journal. ^ a b c Pfefferman, Naomi. "Valley to Hollywood: An Actress' Journey". Arts in LA. Archived from the original on 29 September 2007. Retrieved 29 July 2015. ^ a b Scheinfeld, Jillian (28 October 2013). "Interview with Interesting Jews: Actress & New Mom Shiri Appleby". Kveller. ^ a b c Rivers, Joan (15 January 2014). "In Bed With Joan - Episode 41: Shiri Appleby". In Bed With Joan. Retrieved 29 July 2015. ^ "Evan Michael Appleby - California Birth Index". FamilySearch. Los Angeles, CA. 1 July 1980. Retrieved 29 July 2015. ^ Baxter, Kevin (7 October 1999). "My Favorite Weekend: Shiri Appleby". Los Angeles Times. Retrieved 29 July 2015. ^ Appleby, Shiri (23 May 2012). "My Road To Receiving A College Degree". Hello Giggles. Retrieved 29 July 2015. ^ Elias, Justine (31 October 1999). "Spotlight; Hey, Everyone's Cool, Teen-Age Aliens Too". The New York Times. Retrieved 29 July 2015. ^ Kenna (2 May 2004). "DVD Review: Roswell: The Complete First Season". Crashdown. Retrieved 23 September 2006. ^ Milzoff, Rebecca (1 February 2010). "Life Unexpected's Shiri Appleby on the CW Cabal, Fading From the Spotlight, and Playing a Mom at 31". Vulture. Retrieved 29 July 2015. ^ a b Caldwell, Sarah (9 June 2015). "UnREAL's Shiri Appleby on Why She's Happy to Be Playing a Character Who's Not 'Consumed With a Guy'". Vulture. Retrieved 29 July 2015. ^ a b Angelo, Megan (27 July 2015). ""UnReal" Star Shiri Appleby On What She's Learned About Being an Ambitious Woman". Glamour. Retrieved 29 July 2015. ^ Hochberg, Mina (4 March 2013). "Shiri Appleby on Playing Adam's New Love Interest on Girls". Vulture. Retrieved 29 July 2015. ^ Andreeva, Nellie (6 February 2014). "Lifetime Picks Up Marti Noxon's Dark Comedy Pilot 'Un-Real' To Series". Deadline Hollywood. Retrieved 9 February 2014. ^ Otterson, Joe (2017-07-28). "'UnREAL' Renewed for Season 4 at Lifetime, 'Mary Kills People' Renewed for Season 2". Variety. Retrieved 2017-07-28. ^ Holmes, Linda (1 June 2015). "'UnREAL' Is An Unsettling Look At Making Unsettling Television". NPR. Retrieved 29 July 2015. ^ Shukert, Rachel (29 June 2015). "Television's Most Alluring Antihero is a Fictional Jewish Woman". Tablet. Retrieved 29 July 2015. ^ "Shiri as a Vet". Teen. 1 May 2000. Retrieved 29 July 2015. ^ UsWeekly Staff (16 August 2012). "Shiri Appleby Is Engaged to Jon Shook!". Us Weekly. Retrieved 3 September 2012. ^ Martin, Brett (18 August 2009). "From Los Angeles, Bearing Lots of Meat". The New York Times. Retrieved 29 July 2015. ^ a b Rodbard, Matt (3 April 2013). "Shook, Won: How A Chef Made It All Work Spectacularly Well In Los Angeles". Food Republic. Retrieved 29 July 2015. ^ Rodell, Besha. "Best Restaurant (2014): Trois Mec". LA Weekly. Retrieved 29 July 2015. ^ Michaud, Sarah (29 March 2013). "Shiri Appleby Welcomes Daughter Natalie Bouader". People. Retrieved 18 July 2015. ^ Braun Davison, Candace (15 July 2015). "Watch Shiri Appleby and Her Chef Husband Make The Sickest Nachos Ever". Delish. Retrieved 29 July 2015. ^ Nahas, Aili (21 December 2015). "Shiri Appleby Welcomes Son Owen Lee". People. Retrieved 22 December 2015.